Rathmines public library was built in 1913 with the aid of funds from the Carnegie United Kingdom Trust. Andrew Carnegie was a Scottish/American industrialist who was responsible for allocating the funds. Andrew, who was born on November 25th 1835, was the man behind the expansion of the steel industry in America. Carnegie was born in Dunfermline, Scotland where he lived for some years before emigrating in 1848 to the United States with his parents. Carnegie intentionally started out as a factory worker and landed his first job in a bobbin factory. Eventually he worked his way up and began working for a telegraph company. It was from there that he built Pittsburgh’s Carnegie Steel Company. Carnegie, who is often referred to as the second richest man in history, earned most of his fortune in the steel industry. He invested most of his earnings in establishing schools, universities, libraries and museums. The majority of them were located in the United States, Canada, the United Kingdom and Ireland. One of his most famous buildings is Carnegie Hall in New York. 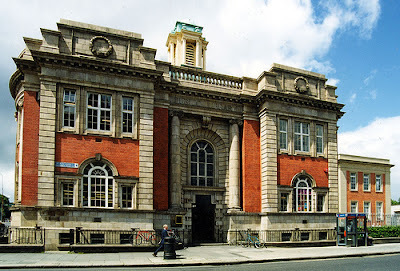 Although the building we know today as Rathmines Public Library was built in 1913, the library originally had two previous locations. It was initially located at number 53 Rathmines road. However it quickly became very popular and more space was needed to accommodate its customers. In the year 1899 it moved to 67 Rathmines Road where it stayed for 14 years before moving to the building we know and use today. At the time of construction, a competition was held to design the new library. 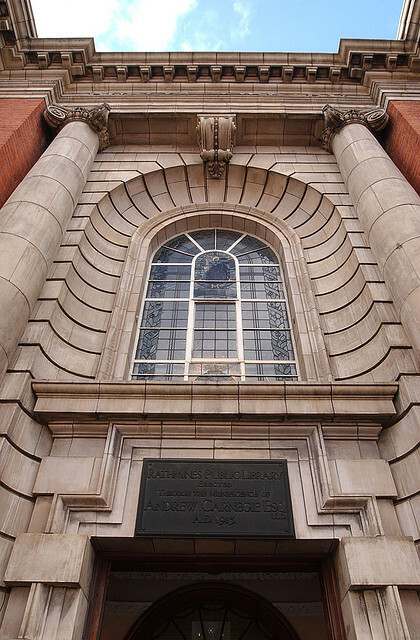 Frederick Hicks won the competition and the firm of Bachelor and Hicks of Dublin were the architects awarded the design of the new building. 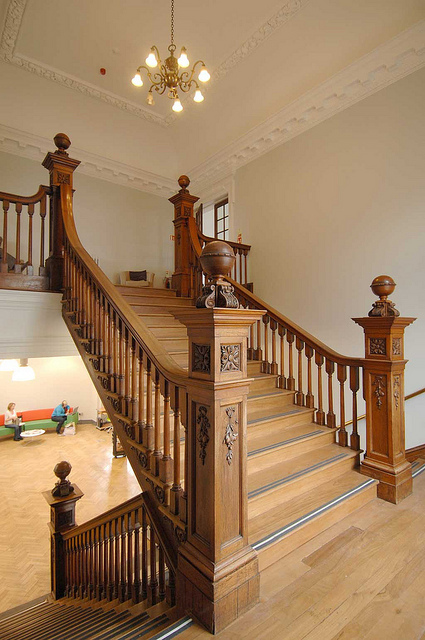 The library was built with the aid of £8,500 from the Carnegie grant and it opened its doors on the 24th October 1913. 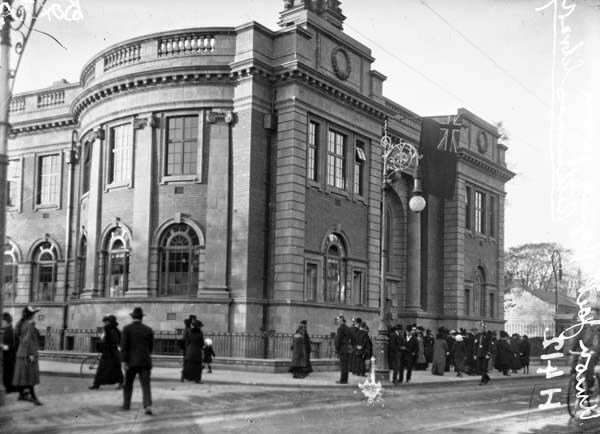 The overall design of the library was intended to blend in with the design of the Town Hall as much as possible and to act as ‘an ornament to the township’. Although the library and technical school are adjoining and part of the same building they have two separate entrances. The library, as well as having a lending department where people could visit and borrow books, also had a special room where people could come to read the newspapers each day and a reference library where people could sit and read at their leisure. Newspapers were expensive items in the early 1900’s and the newspaper room was extremely popular as people could look up the job pages and catch up on the latest news for free. 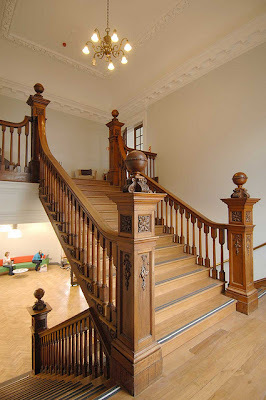 The library features a beautiful stained glass window which is located half way up the double staircase and was designed by William Morris, who was a famous English artist and designer. The library is also home to the only surviving plaque from the Princess cinema. The cinema was opened as the Rathmines Picture Palace on March 24th 1913 just several months before the opening of the library. The library was used by various different community groups and clubs in the area. The Public Health Department held its clinics in the library. The Thomas Davis branch of the Gaelic League also held their meetings in the building as did the Rathmines chess club.